Today, we serve customers across the U.S. and abroad. Our large inventory and warehousing capability allows us to serve a wide range of customers with many types of applications. Currently, we have over 15 million magnets in stock. We have excellent resources for raw material magnets and the machinery to cut, grind and magnetize magnets to meet our customers applications. 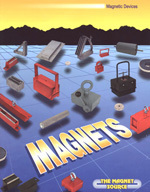 Our other manufacturing capabilities allow us to produce a wide variety of magnetic assemblies.